A few weeks ago, I went to go see the film A Quiet Place with a friend. There, for the first time, I had the kind of communal theater-going experience about which film critics tend to wax nostalgic. This is not a review of A Quiet Place, so I won’t bore you with my impressions of the film, but it is important to note that I spent most of the movie frozen in my seat with my hand clamped over my mouth. About twenty, thirty minutes into the film, the family comes under threat from the monsters for the first time in the film since the vents of the prologue. After a seemingly innocuous accident during a board game, the family huddles in terror as monsters shriek and assault their hiding place. As this scene wound its way to a close, and I — and the rest of the people in the theater — began to relax, someone a few rows behind me knocked over a glass bottle. The entire theater gasped, and a wave of nervous laughter washed across us all as we realized what had happened. To be quite honest, this was the first time I had experienced anything close to what film critics seem to mean when they decry the rise of home video and streaming as the death of cinema. This has always rung as false nostalgia to me, perhaps because I associate theaters less with the quiet company of unknown others, and more with the annoyance of an introvert forced to enjoy herself in public. This is the tension that appeals to me in Nicholes Rombes’s revised edition of his 2009 Cinema in the Digital Age, recently reissued by Wallflower Press. Rombes actively fights his own tendency towards nostalgia — not just for the theater, but for analog media and even for the early media of digital film. Cinema in the Digital Age begins with Rombes going to see the Wachowskis’ Jupiter Ascending out of what he calls “sheer stupid curiosity.” “I had been intrigued by the terrible reviews, the sorts of reviews that actually make the film sound interesting,” Rombes writes, noting that the film already seemed like “a cult film in waiting.” The years since its release have borne out this impression — Jupiter Ascending absolutely is the focus of a particularly fervent kind of fandom made up of an audience of (mostly) female sci-fi fans who write long paeans to the film and the way it centers the female gaze, among other aspects. I am no film theorist, so this is where my approach and interest in Jupiter Ascending diverges from Rombes’s: I cannot read the images, the surface, of Jupiter Ascending except in constant relation to a different kind of “meta,” the fiction, the discussion, the plethora of response that has grown around the film online. This is where Rombes’s analysis of contemporary film felt both lacking and full of possibility: engagement and consumption in Cinema in the Digital Age have less to do with sitting in the dark with strangers and as much with using the pause button as a tool for attention, or with interacting with a puzzle hidden in a DVD menu. But who uses DVDs anymore? (Recently, I was told a story about a friend’s ex, whose absurd and vindictive behavior escalated to the demand, four months after the end of the relationship, to be allowed back into my friend’s house to look for some forgotten DVDs. The general consensus amongst the group was that it was ridiculous for anyone under the age of 30 to be that concerned about DVDs in 2018. “Who even owns a DVD player anymore?” was the refrain.) When almost everything is available to stream — either legally or not — the next step of engagement is not individual but communal: discussing, arguing, creating with other viewers across the internet. Furthermore, it often seems as if experimental — a certain kind of experimental, anyway — works are so self-contained that they allow practically no critical access point. To borrow another of Rombes’s examples, what is there to say about the explosion of horror tropes in Cabin in the Woods that the film itself does not already articulate — in many cases, explicitly? “Postmodernism was an essentially democratic movement,” writes Rombes, “because its metanarratives — its self-consciousness, its parody, its pastiche, its irony — always worked to make visible the codes that underlie cultural productions.” At this point, however, we — and I use the pronoun to mean myself and that cross-section of audience who would be interested in a work of film theory and has seen Jupiter Ascending at least once — have become classic cynical subjects. I watch Jupiter Ascending knowing full well that it is trash, but I, too, have always liked dogs, and I am willing to let myself sink into spectacle. If at this point it seems as though I am not truly reviewing Rombes’s book but rather straying from it into my own interests — you’re not wrong. And yet, I hope that this can be read as fidelity to Rombes’s method, if not his subject: after all, as he writes, “What digital-era film theory illuminated has less to do with film itself than with how film is thought and written about. Film theory as a creative act: this may very well be its greatest legacy.” The subjects range across genre and time, from arthouse film to summer blockbusters, and Rombes’s critique stays as intent. 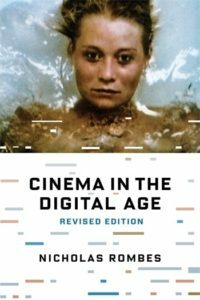 This is the true pleasure of reading Cinema in the Digital Age — Rombes weaves together critical theory, film criticism, cult films, and popular culture into short, seemingly randomized essays that each illuminate something quite specific. And perhaps this is the kind of enjoyment available to us after postmodernism — a self-conscious, overenthusiastic, creative kind of enjoyment, in which we must turn these objects into something else because we know too much to allow them to only say one thing. Read an excerpt from Cinema in the Digital Age here. Eleanor Gold is a Reviews Editor for Full Stop.